Oh, corporate America. You do have your ways. One of those ways involves moving me through four spaces in two years, all within a thirty-foot radius. In a 1400-person building. Like a hamster scratching out a path in cedar chips. At least the facilities guys will always have jobs. So I took some things out, brought some things in. At the top is a lamp and a picture going in; on the bottom is a chair and two lamps going in. That was a wet day, on the bottom. Heavy rain, but not a lot of wind—which, rain without wind can be kind of nice. I actually like riding in an easy rain. In the rain is the one time when I get into cycling-specific gear. Any other time, hi-viz makes people look like construction workers who’ve lost their keys. Even at night, I prefer good lights. It’s the mesh tank-vests that kill it. Unfortunately, rain brings the visibility way down. Since we’ve a 50/50 chance any given driver will see us in broad daylight, I wear a hi-viz rain cape and spats in the rain. Spats! Now, please, someone stitch together a cape in a fashionable color and run reflective piping through it in an unexpected pattern—you will corner the market on rain capes. Kill the neon yellow marshmallow. Maybe come up with a better name than “cape” while you’re at it. People who cycle to work in the States are generally nerdy enough. A full rain suit—pants and jacket—is too sweaty. An umbrella isn’t practical with the hills or any wind. The cape alone leaves me with soaking, filthy shoes, even with fenders. So, yes, I wear a cape and spats and it’s the only thing that keeps me dry. I’m incredibly glad I don’t have a picture of myself in it anywhere. It’s a British style; it goes with their Raleighs. It’s meant for a position slightly forward on the bars. Henry Cutler has written that they don’t work with the upright Dutch bikes, so I was expecting a mess when I rode in, but it wasn’t the case. Worked just like it usually does. Could also have been the canopy blocking a lot of water. 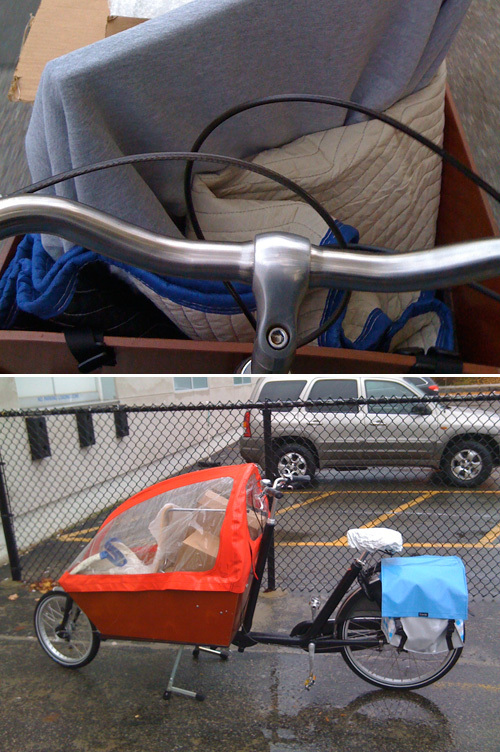 Still, riding in the rain is generally pretty great, even with the ridiculous wear. Most of the time we have rain, it’s light enough to wear any jacket. It’s also rare that on a day I go in under the rain, I come back home under the rain or vice versa. The chair and the lamps came from an Ikea trip we made earlier in the week. We had a classic eye-rolling moment in the parking lot. We came early because we brought the kids, so we got a spot in one of the rows near the entrance. We’re coming up to our car—two shopping carts, two toddlers, half a dozen boxes—when someone trolling for a space stops and turns on their blinker. We haven’t even unlocked the doors at this point. You can fill in just how long it took to unload and how accordingly long that car sat with its turn signal on while other cars queued up behind it. Even accounting for the Home Depots of the world, you are going to do a lot of walking in an Ikea. What’s another couple hundred steps in the parking lot?